I have always liked to run. Personally speaking, I think that this is all to do with the way that my adrenalin surges every time I press heal upon pavement. Or alternatively, it has something to do with this comic book Written by Francis Manapul; Drawn by Brian Buccellato; and Published by DC Comics in October 2011. Now all Barry Allen wanted to do, was to go to the Central City Science Fair with his new beau, Patty, and then have a good time. However, what he got instead was something else entirely. 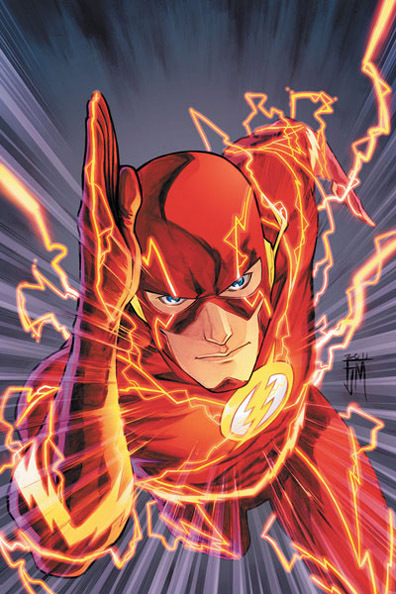 As amidst a conversation that Barry and Patty are having with science guru, Dr. Elias, this lo-cal is suddenly attacked by a number of numbered men in armour-plated attire – causing Barry to turn into the Flash – causing the Flash to stop these fiends from steeling a genome decoder – and causing one of these chaps to die in the process. In the aftermath of this event, journalist, Iris West, wants to know if the Flash is the culprit of this deed – and tries to ‘pick-up’ Barry whilst interviewing him. Moreover, Barry wants to know why the man who died was once his friend, Manuel – a fact that shocks him straight away. So does Barry try to investigate this matter further back at the lab? Yes – yes he does. But in so doing, Manuel abruptly turns up alive when Barry is alone by himself, and then takes him for a little run through Central City. Isn’t that nice, huh? Yep – but not as nice as when Barry shrewdly suits up into his Flash costume, and is then presented with Manuel’s a plenty. Now this is the comic book that I was really interested in reading post ‘Flashpoint’. However, not only was this because of the new creative team and re-jigged costume (which is slightly OK, if I ignore all of those silly lines glaring all over the place), but because I wanted to know if this DCnU Flash would allude to the un-DCnU Flash (if you get my gist). And did this issue answer my question. No – not at all. Instead, it gave me a whole new set of other questions to ask. Question 1) Why does this new creative team feel like the old creative team? Because, in essence, the art by Brian Buccellato is very reminiscent of the art by Francis Manapul. And the same can be said about Francis Manapul’s words compared to Geoff John’s words. Still, this isn’t a bad thing in my eyes – just a peculiar one. Question 2) Why is Patty in and Iris out? Also, why nix Barry’s old marriage to Iris in the first place? Now, to me, I did not see the reason why Barry and Iris’s past relationship should diminish in the DCnU, because the DCnOLD one did not really get the chance to explore this facet of Barry all that much to begin with. Question 3) Did I like this Flash comic book? Well, apart from the distracting speed lines on the Flash’s costume, as well as the pointless chin-guard, I thought that this new Flash series was very similar to the old one in style, tone, and execution. Granted, the major change in this book is in the Barry / Iris relationship – but time will tell if this will last or not. Also, I did not mind this introductory issue – as it began a story that has a silver age flair to it that I just love. Now are there any more questions on my behalf? Yeah – most probably – but for the moment, I will just wait and see how this series unravels. Because, you never know, it may give us a surprise or two in the future (i.e. Where’s Wally?). Nice issue – same as the old issues – but nice all the same.